This is part 6 in a series of profiles on places we visited during Doors Open Toronto in May. It was a rainy day in the Beaches as I set out to find out more about solar energy at the Beach Solar Laundromat. Though I'd read a bit on the subject I'd never seen it in practice and this was the perfect opportunity. Alex Winch, the man from Mondial Energy, would be there to walk me through it. I arrived in the middle of a tour as a huge group, bursting with enthusiasm, was asking Alex question after question. He showed them his real-time online stats for various commercial buildings throughout the city and offered up details on how he's made it all happen. What his company does is invest into the set up of solar thermal panels on the roof of a building - the property owner has no upfront costs. 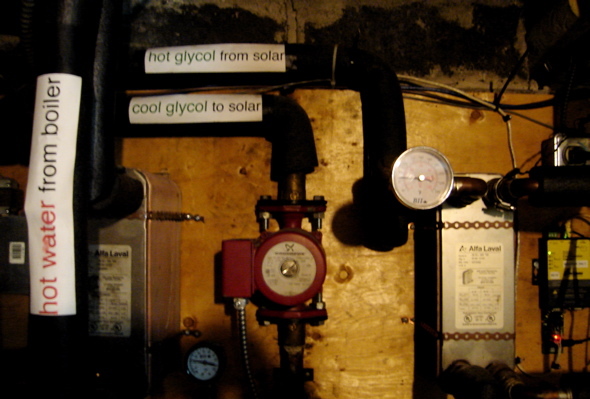 The panels, made from copper tubing painted black, are owned and serviced by Mondial who then sells the solar thermal service back to the building owner. It makes perfect sense for a company like a laundromat that would otherwise be using natural gas to heat the water. With the solar thermal panels conducting heat into large insulated water tanks they've captured 20,000 kWhr annually, cut natural gas use by 30% and saved a bundle. They've also seen a substantial rise in revenue thanks to piqued curiosity for green consumer practices. Alex has helped a few others with their solar needs. 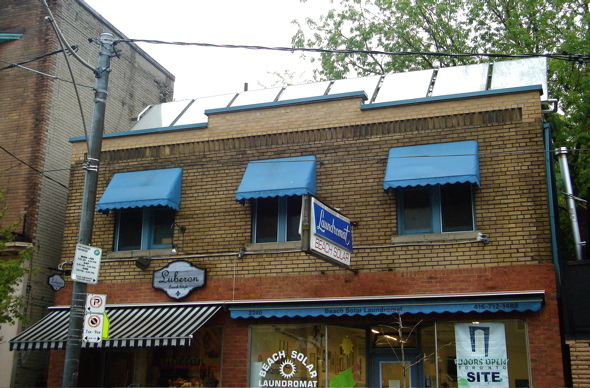 Multi-unit residences on Coatsworth and Kingston Rd in Toronto also have solar panels. Deals appear to be in the works too with a few international hoteliers that are looking to green their image, appeal to a younger demographic and add architectural interest to their buildings. Despite his success his big challenge seems to be getting a deal in place with one of Toronto's largest landlords, Toronto Community Housing. Though Mayor Miller has said he has plans in place to make city-owned buildings more energy efficient, it seems the City may be too bogged down in bureaucracy when it comes to their bidding process' to really consider alternate energy sources.